Some time go we were able to read article on the Sun written by Janmastami dasa entitled, “The Truth, the Whole Truth, and Nothing But…”. What caught my attention was a legal document attached to the article. These are photos of the testimony of witness Dharmatma das (Dennis Gorrick) regarding the murder of Sulocana das (Steven Bryant). I don’t know if readers really noted the contents of the letter. Usually such subjects raise a lot of dust, but this one went by quietly, unnoticed. I would like to focus attention of readers on parts of this testimony, which particularly deals with the involvement of Radhanath Swami in this case. 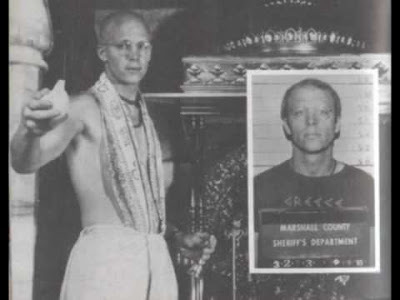 The characters in this testimony are Dharmatma (Dennis Gorrick), Kuladri (Arthur Villa), Radhanath (Richard Slavin), Hayagriva (Howard Wheeler), Tapahpunja (Terry Sheldon), Tirtha (Thomas Drescher) and Kirtanananda (Keith Ham, Bhaktipada, Mr. Swami, Number One). From Dharmatma’s testimony it is clear that he was disturbed by murder, and quite disturbed also was Kuladri das (Arthur Villa). Kuladri mentioned to Dharmatma that this murder should not happen, and how he told them (Radhanath, Hayagriva and Tapahpunja) not to do it. He mentioned that Radhanatha (Mr. Slavin), Hayagriva (Mr. Wheeler) and Tapahpunja (Mr. Sheldon) were pushing like crazy for the murder to happen. In our ISKCON slang, we know exactly what ” pushing like crazy” means. It means they were pushing real hard, they were really into it, working hard for it to happen over an extended period of time. And Dharmatma mentions Radhanath in the first place. One can conclude from this that since Radhanatha was the first one who came to Dharmatma’s mind in connection with the murder, it may be that he was the main organizer. This will be later supported by another incident. Later on we can read how Tapahpunja (Mr. Sheldon) was describing to Dharmatma about how neat it was, that the demon (Sulocana) was killed on the Appearance day of Nrsimhadeva. Dharmatma states that he was freaked by this. Tapahpunja was present at the murder, and he was describing it in detail. And then starts the description of an arrangement for escape money. Now Tapahpunja and Tirtha (Drescher) had to get out of the country, so they needed money. Tapahpunja came to get money, but Dharmatma told him to go to Number One (Bhaktipada, Mr. Swami). 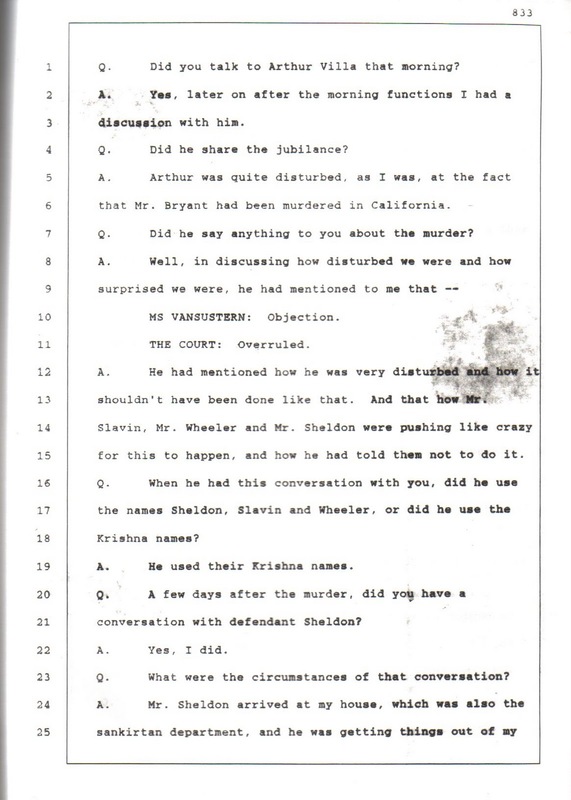 The testimony then continues to describe how the next day, Mr. Swami along with **rot not (Mr. Slavin) came to pick the money. Please note that at this point of testimony, Dharmatma actually used the name Radhanath, but the court stenographer, not knowing what that word Radhanath is, typed it as “**rot not”. Rot not sounded similar to Radhanath, so the typist wrote that, preceding it with **, which shows that stenographer was not sure about the correctness of the typed word. So, Kirtanananda and Radhanath came with the car to Dharmatma to pick-up the money for murderers Tirtha and Tapahpunja, to help them escape out of country. Kirtanananda asked Dharmatma to give 6,000 dollars. Dharmatma went inside the house to get it, and gave it to Kirtanananda, who waited in the car. Then Dharmatma describes how he asked about the purpose of money, if it was for the murderers to get out of country. And in answer, Kirtanananda and Radhanath smiled, and nodded their head in confirmation, that yes, this was for the murderers to be able to escape out of the country. And then Kirtanananda and Radhanath drove off. This testimony by Dharmatma clearly implicates Radhanath in the murder of Sulocana. Radhanatha was involved in arranging for the murder, being one of those who were “pushing like crazy for murder to happen”, possibly the leader. His leadership position in the conspiracy against Sulocana is confirmed also by his picking-up the escape money, together with Kirtanananda. One thing was the preparation of Sulocana’s murder, and a second thing was making arrangements for the murderers to escape the country. Only Radhanath was present on both occasions, which shows that he was involved more than others. So, what the GBC is saying is: According to present evidence, Radhanath is not guilty. But if he later proves to be guilty, and the case is reopened, the GBC will cooperate. The GBC was not able to fully guarantee for Radhanath, so they felt the need to protect themselves in case Radhanath goes down anyway, by stating that they will cooperate with any appropriate legal agency. The GBC leaves it up to the legal system to decide whether Radhanath is guilty or not. The GBC’s approach is interesting, since many ISKCON gurus were suspended without any involvement of the legal system – Vaisnavas have their own rules for who is bonafide guru. Vaisnava expectations for guru are higher than the state’s expectations for a good citizen. Clearly, the GBC considers Radhanath as a bonafide Guru, no matter his involvement in murder. Is involvement in murder of a devotee, 20 years later, not disqualification enough for one being an ISKCON guru? In my opinion, Dharmatma’s testimony proves without doubt that Radhanatha was involved as the leading organizer of murder. Of course, the case probably cannot be reopened now legally. But the evidence is clear. Radhanath was involved, and no matter what the GBC now does, it is clear that Radhanath was involved in the murder of Sulocana. Radhanath last year openly stated, in front of entire world, that every allegation against him is false, and that he was never involved in any criminal activity. With the testimony from Dharmatma, this statement of Radhanatha’s doesn’t stand strong. It is clear that Radhanath was lying regarding his involvement in the murder. He lied to the GBC, in front of the entire ISKCON society. Now, what does this make him? Clearly, a liar. Why was he lying? The GBC can be of the opinion that involvement in murder of a devotee, 20 years later, does not disqualify one from being an ISKCON guru. How about 20 years of lying about it, even to the GBC? Would this shameless lying disqualify one from being an ISKCON guru? Devotees are merciful and compassionate. If Radhanath was involved in murder, as the facts prove, and if he admitted it years ago, most devotees would not blame him for his neophyte fanaticism, but would forgive him. Of course, he could not be a big guru and acarya, but he could be a nice devotee, an inspiration for many. But clearly, he was hiding this. He was lying all the time, to everybody, even the GBC. And the GBC made us believe that all is fine. Radhanath tricked the GBC and all of us. The facts are against him now. Everybody knows that he was involved in the murder of Sulocana, and his lies will not help in hiding it anymore. Will he admit now, and beg for the mercy of the devotees, and thus reveal his material ambitions for position and adoration as an ISKCON guru? Or will he keep hiding it, continuing with his show of humility, to his own disgrace and the disgrace of all his faithful followers? And for the GBC, will they keep such a cheating, lying guru as their very best, or will they slowly and quietly push him aside, allowing him to move into the background and retire? In any case, it is finally clear now. Radhanath was very much involved in the murder of Sulocana, and he lied about it repeatedly and shamelessly. Such a cunning person cannot represent Srila Prabhupada as guru in the Vaisnava sampradaya. If he has even a particle of decency left, he will immediately step down from his position as guru, and commit his future life to humble menial service of servants of the servants, which he likes to advertise so much. A. Arthur was quite disturbed, as I was, at the fact that Mr. Bryant had been murdered in California. Q. Did he say anything to you about the murder? A. He had mentioned how he was very disturbed and how it shouldn’t have been done like that. And that how Mr. Slavin, Mr. Wheeler and Mr. Sheldon were pushing like crazy for this to happen, and how he had told them not to do it.